Bonus Challenge Futurity winner Stripper Dust is one of the favorites in the first trial for the Alex Picov Futurity on Monday. AJAX, ONT—SEPTEMBER 16, 2018—The fall championship races for Quarter Horse racing at Ajax Downs are nearing and the Monday, September 17 day of racing begins the journey for the top 2-year-olds in Ontario. Two trials for the $75,000 Alex Picov Futurity, one of the most prestigious races for juveniles in Canada, have attracted fields of nine and 10 tackling 400 yards. Mildred Didrickson, a filly named for the remarkable track and field Olympian and champion golfer, is one of the major players in the first trial which is race 2. Owned by Milena Kwiecien and trained by Ajax Downs' leading conditioner Jason Pascoe, the filly was a trial winner at Canterbury Downs in Minnesota and is making her Ajax debut. Her stablemate Stripper Dust, winner of the Bonus Futurity Stakes here on July 15 is also an exciting entrant. The second trial, going as race 3 is headed by Erik and Joyce Lehtinen's Shes Sizzling, an Ontario-bred who began her career in the U.S. and has two wins from four starts. 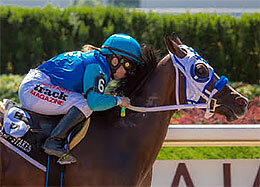 Monday's card has also lured reigning Horse of the Year Country Boy 123 who is entered in the 250-yard Sprint Series. Unbeaten in five starts in 2018, Country Boy 123 is prepping for the important Alex Picov Memorial Championship and this will be the shortest distance the 5-year-old has ever attempted. Post time Monday is 12:55 p.m.
All the Ajax Downs events can be found at ajaxdowns.com.